Do you ever think it would be great to splash around in a pool, dance to some rocking 80s tracks and feel like you’ve had a great workout all at the same time? Well look no further my friends, than water aerobics. The great 80s dry-land-aerobics spin off has made a comeback this summer, revitalised and rejuvenated for 2014. Okay, so there may not be any spandex but there are the coolest shower caps (see here) on earth along with some old moves and splendid tunes. 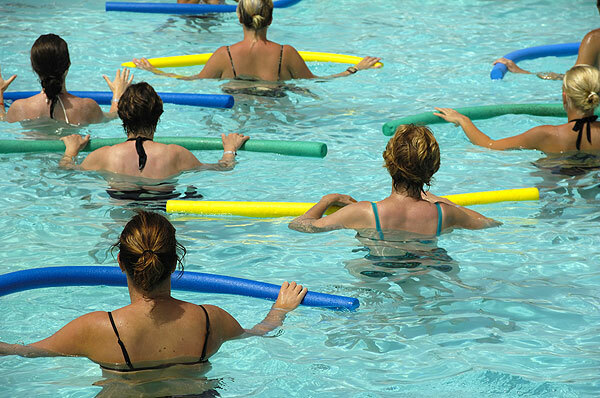 Jokes and fun aside, water aerobics is also an extremely refreshing workout. Classes vary from 45 to 60 minute sessions and incorporate dance, weight lifting and resistance training all in one. The low impact on your body is a great way to recover from land sessions, stretch out your muscles and work up a sweat. The instructors are often former aerobic extraordinaire and focus on strong technique and having a fun time. Water aerobics is a great way to get into shape, return to regular exercise after a long absence and cool down from the summer heat. What better way to start your day this summer than going for a dance and a dip.